The University of Kerala was founded as the University of Travancore in the princely state of Travancore in the year 1937. It was established by the Maharajah of Travancore, Sri Chithira Thirunal Balarama Varma who was also the first Chancellor of the University. Sir C. P Ramaswamy Ayyar, the then Diwan (Prime minister) of the State was the first Vice-Chancellor. 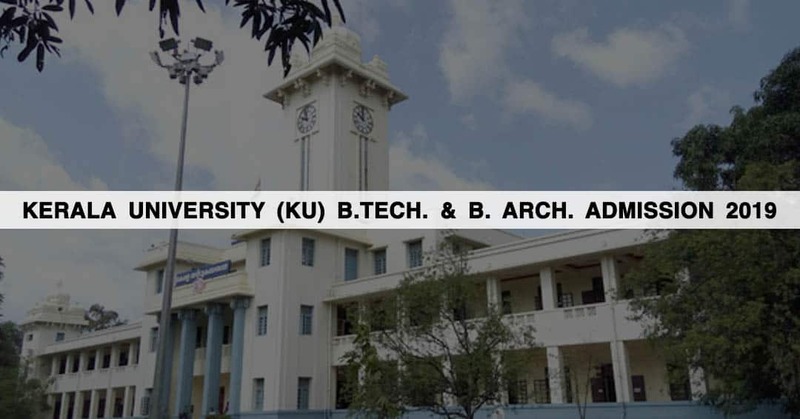 The university is inviting applicants for B.Tech and B. Arch. Kerala Engineering, Architecture & Medical Examination (KEAM) is the entrance exam for B. Tech aspiring students. Students should have passed the Higher Secondary Examination, Kerala or 12th Standard V.H.S.E., C.B.S.E., I.S.C. or any examination accepted by the university as equivalent with not less than 50% in Mathematics and 50% in Mathematics, Physics and Chemistry/ Biotechnology/ Computer Science/ Biology collectively. Students looking for admission in B. Arch should have passed the Higher Secondary Examination, Kerala or 12th standard V.H.S.E, C.B.S.E, I.C.S.E or an equivalent examination accepted with Mathematics as an optional subject and with not less than 50% marks in aggregate Or a diploma in engineering awarded by the Board of Technical Education, Kerala or an examination after undergoing an institutional course of at least three years with minimum of 50% marks in the final diploma examination Or an International Baccalaureate Diploma, after ten years of schooling, with not less than 50% marks in aggregate and with Mathematics as compulsory subject of examination. You should apply for KEAM only through online mode on the official website of CEE, Kerala. There are seven steps for online submission application. You should complete all steps and send a printout filled application form with necessary documents to CEE, Kerala on or before the last date of form submission. Visit the website www.cee.kerala.gov.in and find the link “KEAM Online Application”. Students looking for admission in Architecture course can apply in online mode from NATA official website. Colleges will be allotted to the students on the basis of their performance in KEAM. As a part of the selection process, KEAM qualified students have to attend the counseling session which will be organized by the Government of Kerala after the announcement of result. Seats will be finalized only on the basis of choices made by you at the time of counseling & rank secured in KEAM. All Admissions to Architecture degree course shall be subject to the passing of the National Aptitude Test in Architecture (NATA) conducted by the Council of Architecture. No lateral admission shall be permitted as per the minimum standards of Architectural Education Regulations 1983 of Council of Architecture and AICTE notification, July 1992.